Rachel Pilcher: Panther City Review 2018 is Open for Submissions! 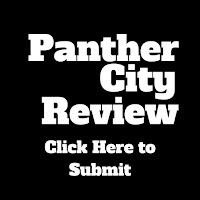 Panther City Review 2018 is Open for Submissions! I am so proud to announce that Panther City Review 2018 is now open for submissions! The theme for this issue is "Wisdom." The submission fee is $5 per entry (Poetry may submit up to 5 poems for $5). Please make sure to include the type of entry in the title of your document file (ie- nf=Non-Fiction, ss=Short Story, etc.). Please make sure your file is an editable file (ie- .docx or .rtf). We are also seeking art for the cover. If you are an artist and interested in submitting for the cover art, please make sure to include a document describing the art you are submitting and how it relates to the theme of "Wisdom." Please make sure that your submission is a vertical image (the journal is printed 5.125" X 8"), and submitted as a .jpg file no smaller than 300 dpi. All submissions chosen for Panther City Review 2018 will receive a complimentary copy of the 2018 issue as well as wholesale discounts on any additional 2018 copies. Any submissions not accepted will receive critique notes as a thank you for your interest. If you have questions, please contact Rachel Pilcher at sleepingpantherpress@fortworthwritersbootcamp.com. The deadline is April 29, 2018, 11:59PM.